Out with the old (2015) and in with the new (2016). It’s hard to believe that the new year is upon us fishermen. What a end to the 2015 year of Fly Fishing and Back Country fishing around the islands of Sanibel and Captiva! Tarpon fishing was tremendous all the way to the end of December. Maybe the Tarpon decided to retire in Southwest Florida. Hopefully they will soon outnumber the Minnesotans that decided the humidity is better than below 0 temps. 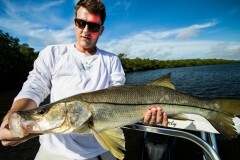 Along with the Tarpon fishing, Snook fishing was great during December. As was the Mackerel, both Spanish and Kings, Bonita, Redfish, Spotted Sea Trout and many other species. 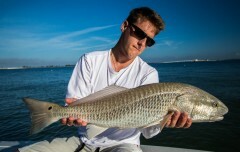 Sanibel and Captiva is loading up with wintertime fishermen ready to head out on the flats to get them some of this action. Multiple fishing trips also provided the unique opportunity for photographs. Not only fish, but birds, dolphins and manatees all wanted to be famous. FlatsFish’r Charters also does photography tours along with instructions on lighting, gear and how to get the perfect shot. 2015 was a great year, and I’m very thankful for all my models (human, fish and animal) for being so supportive!